Cubans have long been careful about what they say and where they say it. However, recent events suggest that Cubans might feel freer to speak out than they have in the past. 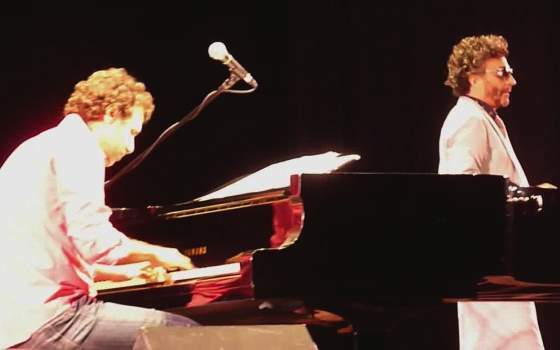 On September 12, during a concert honoring the Cuban Five that was broadcast live throughout the island, Cuban singer Robertico Carcassés of the jazz group Interactivo improvised lyrics calling for free access to information and the election of the president via direct vote. Carcassés' words were unusually frank for a nationally televised concert. But they were especially unusual for an event related to the Cuban Five (Cuban intelligence agents who were arrested in Miami in 1998 and subsequently sentenced to long prison terms; they are considered heroes in Cuba). The Ministry of Culture, which controls music venues and recording, responded by banning Carcassés and Interactivo from state venues until further notice. The incident seemed to confirm that the Cuban government has no interest in tolerating public criticism. Ordinary Cubans, who were able to see Carcassés' comments on television, had wide-ranging and nuanced reactions. Blogger Fernando Ravsberg commented that average Cubans "are divided into those who see Carcassés as an opportunist who ‘stole the stage during the concert for the Cuban Five,' those who regard him as a courageous artist who ‘put everything on the line,' those who think he ‘exercised his rights in the wrong place,' and those (the majority) who simply find the whole thing rather boring." What is perhaps most striking is that many Cubans object not to what Carcassés said, but rather to the forum in which he chose to say it. Artists and intellectuals mixed criticisms of the government for punishing Carcassés with critiques of the singer's choice of venue. Well-known Cuban musician Silvio Rodríguez summed up this sentiment on his blog, writing, "As a Cuban citizen Robertico has the right to say what he thinks. I would have preferred that he would do this in another concert, in a record, somewhere else, because the struggle for the freedom of [the Cuban Five] is sacred to the Cuban people." But Rodríguez also took action. To protest Carcassés' suspension from government-owned venues, Rodríguez invited the singer to perform at two of his own concerts last month. In extending this invitation, Rodríguez was directly challenging the state—government censors would have had to cancel Rodríguez's performances in order to enforce the suspension. In the end, as Rodríguez reported on his blog, after a meeting between Carcassés and officials from the Ministry of Culture, the suspension was lifted—Carcassés and his group can once again perform in state-owned venues. The controversy has not been mentioned in the official media. Murmurs of protest are also surfacing in other quarters. In a letter read in churches on Sunday, September 15—a few days after Carcassés' controversial comments—the Cuban Catholic Bishops' Conference praised the economic reforms that have taken place on the island and called for a concurrent "updating" of the political system. While the bishops stopped short of explicitly mentioning multi-party democracy, they asserted that "Cuba is called upon to be a plural society. … There must be a right to diversity in terms of thought, creativity, and the search for truth." As with the case of Carcassés, the official state-run media has not mentioned the bishops' letter, making it difficult to gauge the official reaction. This is significant in and of itself. The Bishops' Conference released its last pastoral letter in 1993 in the midst of a serious economic crisis; the letter openly questioned the government's monopoly on power and centralized economic policies. The state responded with fierce criticism. Editorials in the official media referred to the missive as a "stab in the back" and accused the bishops of "conspiracy" against the Cuban people. Given such a precedent, no news may be good news. While Carcassés' remarks and the bishops' call for change happened within different contexts, they did not happen in a vacuum. Over the past several years, President Raúl Castro has overseen a wide range of economic reforms that are designed to move Cuba away from a heavily centralized, state-run economy and toward a more mixed economy, with plans to move as much as 40 percent of the workforce into the private sector. While these reforms have happened more slowly than planned, and Cuban officials have insisted that the one-party system is not up for debate, small but real changes have begun to occur in Cuban society. The widely disliked exit visa, which was required for Cubans seeking to travel abroad, was eliminated in January, and according to recent reports, more than 180,000 Cubans have traveled abroad in the last eight months. Over 100 political prisoners were released in 2010 in an agreement brokered by the Cuban Catholic Church; foreign news outlet TeleSur has been allowed to broadcast its content without censorship; and the Cuban Catholic Church has been allowed to carry out adult education classes and public religious processions, among other previously prohibited activities. These advances are limited—recently, Amnesty International designated five new prisoners of conscience in Cuba, and TeleSur, which is funded by a consortium of left-leaning governments, is far from ideologically impartial—but taken together, they signal greater tolerance and modest but genuine progress toward political opening. Critics of Cuba's economic reforms often point out that economic reforms won't automatically lead to political opening. This is certainly true. But as the government continues to make significant changes to Cuba's economy, Cuban society seems to feel more comfortable questioning other aspects of the Cuban reality. Geoff Thale is Program Director at the Washington Office on Latin America (WOLA), which advocates for normalized relations between the United States and Cuba. Mr. Thale has studied Cuba issues since the mid-1990s and traveled to Cuba more than a dozen times, including organizing delegations of academics and members of Congress. Ana Goerdt is WOLA's Program Officer for Cuba.